The magician picks up a small container of soap bubbles. 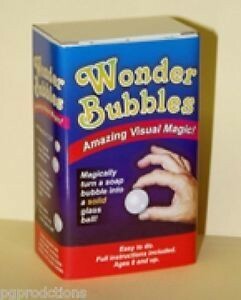 Showing his hands completely empty, he removes the top and dips the bubble wand into the air. 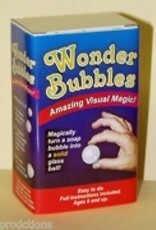 Suddenly he reaches into the floating bubbles, grabs one, and drops it on the table with a thud! The soap bubble has become a solid glass ball!